Photoacoustic (PA) imaging is a promising biomedical imaging modality that has emerged over the last decade. In this method, imaging is performed using pulsed far-red or near-infrared light. This light while scattering through soft tissue is absorbed at specific locations by certain molecules such as hemoglobin in blood. The absorbed energy is converted into heat; the subsequent thermoelastic expansion causes ultrasound (US) to be produced from the absorbing region. The US is measured at the surface of tissue using US detectors and the acquired signals are used to reconstruct the location and spatial details of the absorber. PA imaging thus combines the advantages of optical and US imaging, providing excellent optical spectroscopic contrast with ultrasonic resolution. 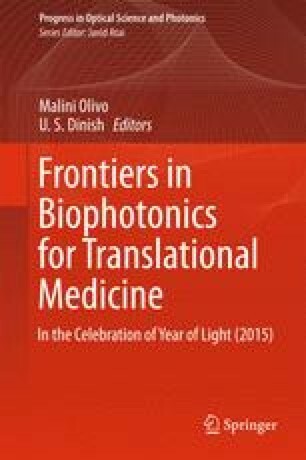 While US imaging utilizes acoustic impedance mismatches in tissue for its signals to provide structural details, PA imaging extracts functional information based on optical absorption by chromophores, predominantly blood, and often exogenous contrast agents. Since PA imaging involves US detection, it can be seamlessly implemented in a commercially available US scanner to perform dual mode PA/US imaging, which is a promising translational medical diagnostic technique. These dual mode systems providing complementary contrast hold potential for myriad of clinical applications. Handheld dual mode US/PA probes use reflection mode imaging geometry, where light irradiation is done from the same side where PA signals are detected. These epi-style handheld probe-based imaging setup delivers flexibility in imaging different body parts using the same probe. This review details the fundamentals of PA/US imaging and also depicts the importance of handheld probe-based dual mode PA/US systems. Particular attention is paid to the engineering aspects of systems developed by different groups and range of clinical applications demonstrated by them. M. K. A. S. and W. S. are funded by the European Community’s Seventh Framework Programme (FP7/2007-2013) under grant agreement no 318067. S. M. is funded by the Netherlands Organization for health research and development (ZonMw) under the program New Medical Devices for Affordable Health.